I can't believe that another week has rushed by and it's Friday again. My goodness, the days are just flying by and I still have so much to do! How are you doing on your Christmas "to do" list? I think I finished my shopping today. I still have lots of wrapping to do and crafts to finish and I haven't even started cooking yet. I also have a house that is in desperate need of cleaning! Our "Christmas" will start very soon - my youngest son will be home on the 18th and my Mama is coming on the 20th....so, I've got to get moving here! My hubby is a big fan of "Turtles" and I thought this cute little turtle from Peachy Keen Stamps would be perfect for his treat bag! * I added some fun twine from Trendy Twine in "Peppermint Stick" and a bright green button from my stash. Now, if that's not "Turtle Love" , I don't know what is! Adorable and I love the bottom you put! Super cute! This is too CUTE! You are so sweet, I'm sure hubby loved his surprise. This is so cute, Tanya. 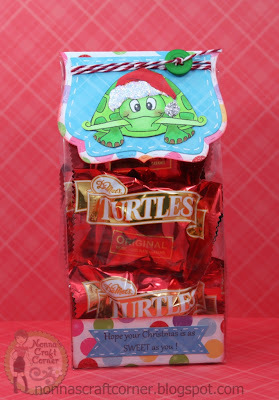 Love the turtle. This brought a smile to my "grumpy" face! Thanks for that!! This is super cute and love that turtle:-) Have a fabulous weekend. Aaah, how sweet of you. Your hubby is so lucky. Hoping to get some shopping done today and my house needs to be cleaned too! Oh yea, he's gonna love it! Super cute!! I am so there with you! Lots to do still, where does the time go? So CUTE! I was looking at that peachy turtle yesterday. I love his santa hat! This is sooooo adorable!!! 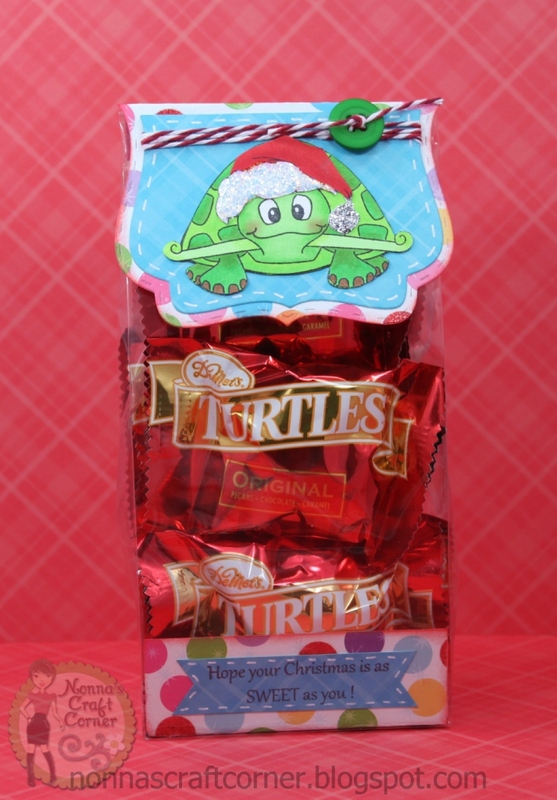 LOVE the cute turtle!!! Bet your hubby will LOVE this!!! Totally with you....too much to do and no time to get it all done :( But that is what makes for a relaxing after Christmas! I am nowhere near finished and my family arrives on the 19th! Unfortunately, I got sick. 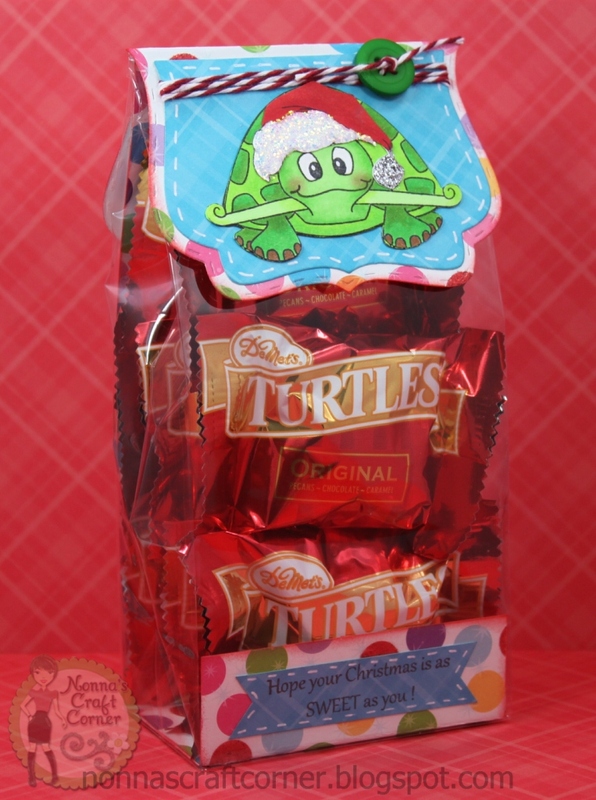 The turtle packagingis so cute and I know your hubby will LOVE it! I'm with him--I LOVE TURTLES! Thanks for sharing, Tanya, and have a wonderful holiday with your family. Adorable Tanya! So much to do,builders and being poorly haven't helped but now I am starting to feel better Christmas prep can start! I love this time of year and am looking forward to sitting down and wrapping pressies before my son finishes school this week. Hope to put the tree up today...we love this family tradition. Hope you have a wonderful time with your family. Wow, sounds like your movin' right along girl....Oh, I am going to be running around like a mad women all week, yikes! It's crazy how it just sneaks up on us, ha? I hope you are doing okay my friend! I'm so busy I can barely stop in and say hi! I'm trying to make my way around and I just love all your projects! Have a great night Tanya!